Friday may feel like April, but by the end of the weekend it will feel more like the beginning of March — and temperatures look to be cooler than average for the rest of the month. WASHINGTON — Friday’s very warm temperatures, humidity, and showers and thunderstorms are definitely what a lot of people think about when they think of April. By the end of the weekend, however, it will feel more like the beginning of March. The weather this past winter was heavily influenced by the effects of the very strong El Nino, but that is now weakening. Even though it’s weakening, it will take some time for its effects to totally go away. 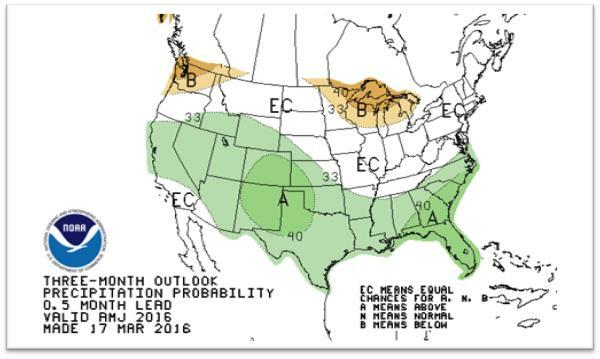 Expect more of the same through the rest of spring, with a few notable exceptions this month. Canada still has plenty of cold air to offer. Most of the winter, the steering winds influenced by El Nino have deprived the cold air of a path to follow into the United States, except on a few occasions. It looks like most of April there will be a blocking pattern in the northern Atlantic Ocean, which will cause the jet stream winds to “buckle” more, sending more cold air our way. This will keep temperatures below normal for a lot of the month, according to the official outlook from the Climate Prediction Center, a division of the National Oceanographic and Atmospheric Administration and a sister organization to the National Weather Service. The good news is that, because some more rain is needed, this setup would provide at least some more opportunities. This type of scenario would mean a lot of unstable, hit-and-miss showers, though, not as much for steady rains that last all day. 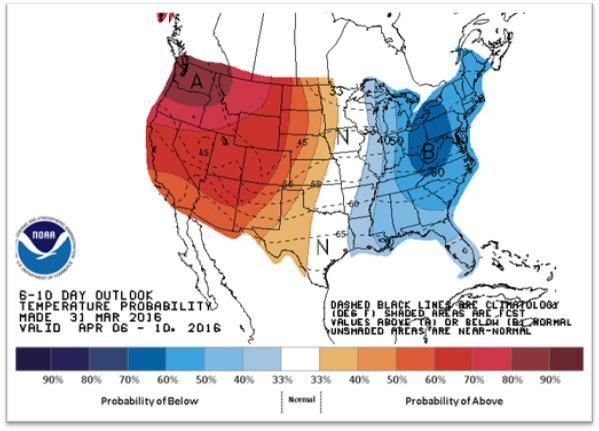 In the following graphics, long-range forecasters are indicating a high probability of below-average temperatures in the East, especially in the Mid-Atlantic and central Appalachians. Unseasonable warmth would be in the West. 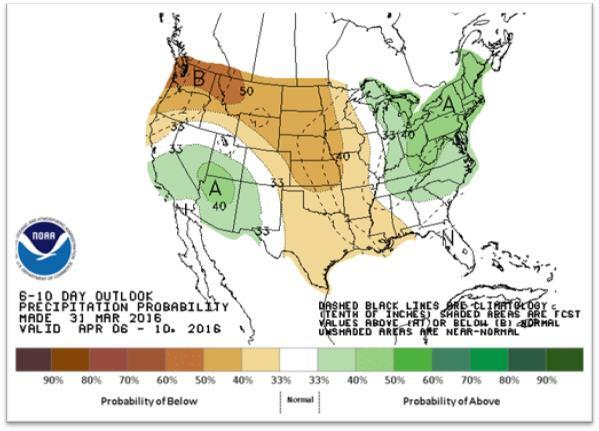 They also indicate a slightly higher than average chance of above-average precipitation, which would benefit the region, during basically the second week of April. The week after, forecasters are looking at the same scenario, but with less confidence, or at least less probability of cooler than average temperatures in the East along with the wet weather. 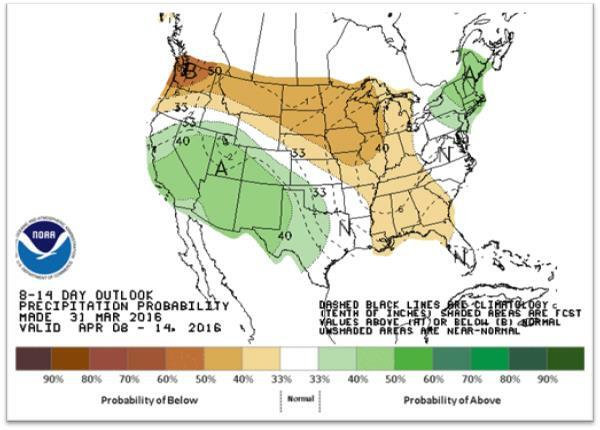 In fact, the probability is for just average precipitation. After that, it appears that the blocking pattern in the north Atlantic will shift, which will allow the effects of the El Nino to dominate the pattern again. 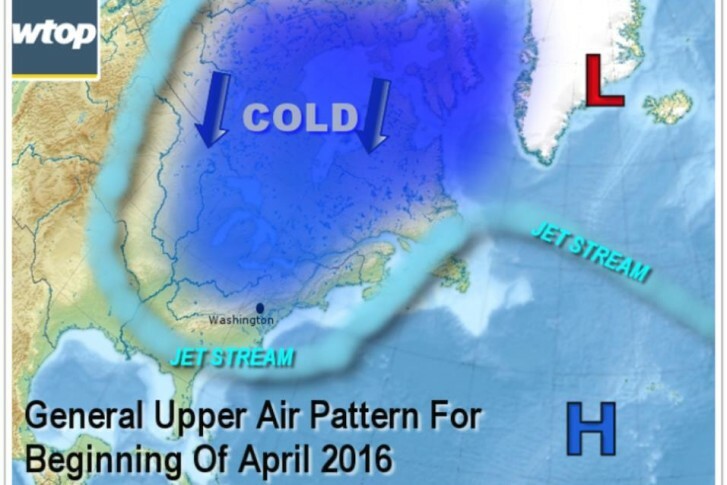 That means the colder air in Canada will be trapped up north. 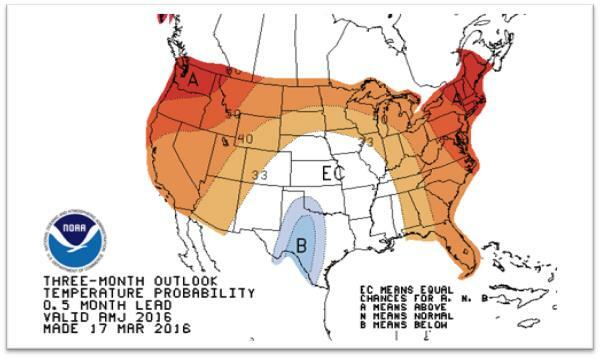 The following graphics show the climate forecasters’ outlook for the three-month period of April, May and June. The likelihood here in the East is for above average temperatures, but with “equal chances” for precipitation to be below average or above average. (At least that’s better than dry weather definitely returning). Keep in mind: These are outlooks, and they involve probabilities of deviations from the average of the past 30 years. They are not forecasts for individual storm systems. 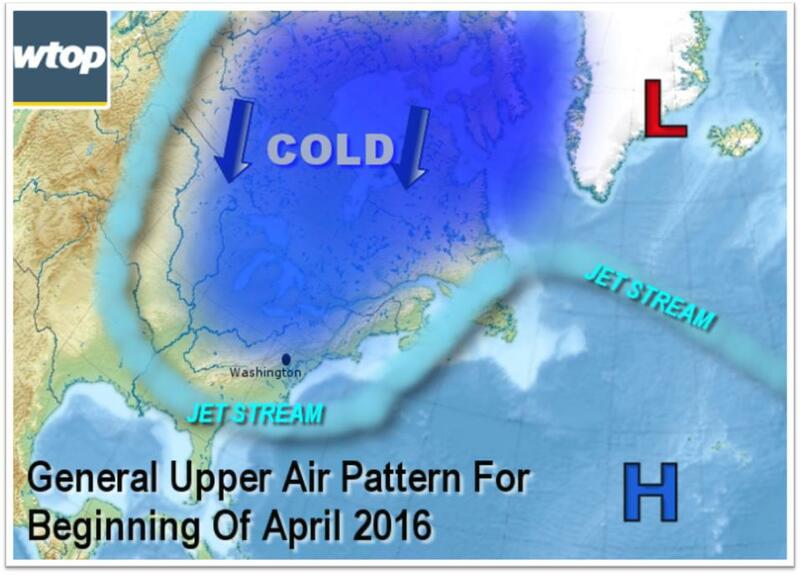 So it’s most likely that the rest of spring will start out unseasonably cool, especially the next few weeks. Every now and then you’ll need the umbrellas. As beach season gets closer, it will most likely warm up again. But there’s not enough certainty to say whether you’ll need the umbrellas more or less often. The specific forecast from StormTeam 4 for the next several days can be found on the main WTOP Weather page.